I have a confession to make. There are some things I am not good at...friends will be amazed to hear me say it, but it's true. There is no place that this is more apparent than being in one of the great superstores like Home Depot or Lowe's...I walk in and am immediately intimidated by the walls of products, usually 6 times my height. I find that by walking quickly and scanning, nodding my head sagely now and then, I can look like I know what I am doing, but I really don't. You know what I want for Christmas this year? 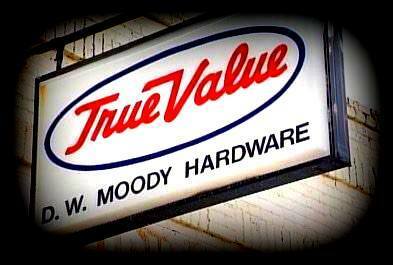 For D. W. Moody Hardware to re-open. A small local hardware store here in Montgomery, AL, they seemed to have just about anything you needed, but the difference was in the people who worked there. I was Bil Hitchcock to each person who worked there...they knew who I was, what I did well with, but more importantly what I DIDN'T do very well....after all they had known me since I was 9.....and I am not too far from kissing 59 squarely on the lips. For instance, if they saw me in paint/stain, they left me alone, knowing I would come to them with just what I wanted, but that I needed to think quietly while I put things together. I was tops in the bird seed aisle, and did pretty well in the gift and sundries section. BUT if they saw me in something scary, like electrical, three would be at my side, carefully guiding me and asking VERY specific questions about amps and 110s and 220s, things I vaguely get...and don't even get me started about power tools...that might bring the whole staff. The point here is that I was working with Dee or Meri Moody, or Tim, Jim, or whoever...they always asked about my Mama, how was that broken arm doing...how did that last paint color work....while they guided me through whatever project I was starting...these people were all my friends. I find I miss that....a lot.....it's sort of like the TV show Cheers.....I DO want to go to a place where everybody knows my name. Come back to me D. W.